In his over 25 year career as a designer of fine jewelry for some of the most well-known names in jewelry manufacturing, Barry Verragio has learned the value of craftsmanship and dedication to quality. Oris Watches originated in 1904 and only makes luxurious Swiss made Mechanical watches. Their signature Red Rotor enabled the progression from hand winding to mechanical. They are famous for their outstanding designs and extreme attention to even the smallest of details. They have a large selection of beautifully crafted watches that come in many shapes, sizes, designs, and materials. What makes Simon G. special lies not only in its stunning designs, but also in the careful attention to the detail. Just like any relationship, it’s all the little things that add up to the big picture. When it comes to quality, we spare no expense. Our jewelry is built to last a lifetime and beyond. 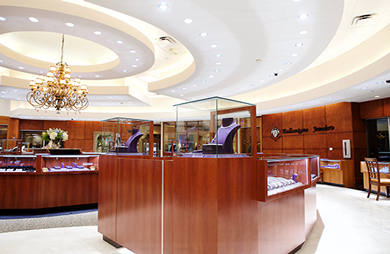 For nearly 50 years, Ballantyne Jewelers has continued to be a destination for loose diamonds, engagement rings, fine jewelry, custom jewelry and Swiss timepieces. Please call (704) 341-4242 for pricing.